Attic and crawl spaces invariably remain ignored and unattended areas of the property until grave problems unfold and threaten to extend into the living spaces. Regular assessment for issues like impaired insulation system, wood rots, pests and termite breeding, and uncontrolled critters activity goes a long way in keeping the attic and crawl spaces tidy, hygienic and functional for years to come. We, at Quartz Solutions, are apt at handling all such issues. Equipped with latest technology and well trained staff, we are competent at providing a fair priced customized treatment plan to clear off the menace. A fully maintained and well kept attic and crawl space is imperative for overall safety and health of your property and family. Infestations invade the dark and dingy spaces and fuel devastating concerns. Leaking ducts cause widespread damage to the property’s insulation and temperature system. It also has a spiralling impact on the utility bills. Insects such as wasps and roaches carry microbes that they spread around in the area triggering harmful infections. Animals like rodents and bats chew wire cables, insulation ducts, upholstery and furnishings. Besides causing extensive damage to products and interiors, they leave a foul smelling clutter that is infectious. Excessive moisture allows growth of mold, mildew and fungus. Humid conditions triggers wood rot, structural damage and pollute air. A thorough inspection of the attic and crawl space is essential to assess and evaluate the current condition of the property. Test the crawl space for leaking gases, monitor the animal and pest activity and examine the condition of ducts, pipes and cables; our experts will visit your home and thoroughly analyze the situation. Based on the findings, a viable plan to clean and restore the attic and crawl spaces will be put forth. We, at Quartz Solutions, strive hard to provide services that create healthier and happier families. 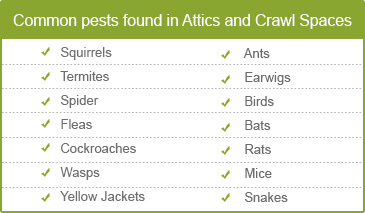 That’s why our attic and crawl space solutions are reasonably priced and easy on the pocket. We love Demarest in Bergen County, NJ! Home to less than 5,000 residents, the borough enjoys great repute. Let your home and office spaces add to its status and standing. 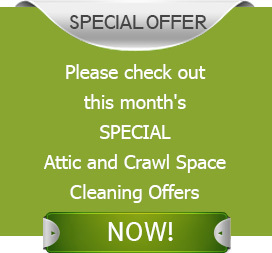 Providing customized attic and crawl space solutions is our forte. Hire us to help you keep your properties in top notch condition. Call Quartz Solutions today 201-205-2042 and avail your free consultation and inspection.